Over recent decades, pain has received increasing attention as philosophers, psychologists, and neuroscientists try to answer deep and difficult questions about it. What is pain? What makes pain unpleasant? How is pain related to the emotions? This volume provides a rich and wide-ranging exploration of these questions and important new insights into the philosophy of pain. Divided into three clear sections – pain and motivation, pain and emotion, and deviant pain – the collection covers fundamental topics in the philosophy and psychology of pain. These include pain and sensory affect, the neuroscience of pain, pain and rationality, placebos, and pain and consciousness. 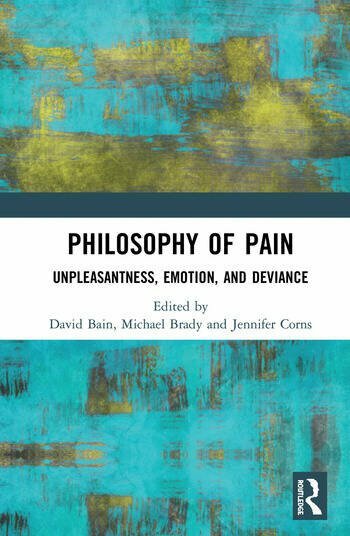 Philosophy of Pain: Unpleasantness, Emotion, and Deviance is essential reading for students and researchers in philosophy of mind, philosophy of psychology, cognitive and behavioral psychology, as well as those in health and medicine researching conceptual issues in pain. 9. The first-person in pain Frédérique de Vignemont. David Bain is Reader in Philosophy at the University of Glasgow, UK. Michael Brady is Professor of Philosophy at the University of Glasgow, UK. Jennifer Corns is Lecturer in Philosophy at the University of Glasgow, UK.